Margaret Wise Brown wrote my favorite childhood book Home For a Bunny. She also wrote Goodnight Moon which is one of my favorite books to read to my kids. 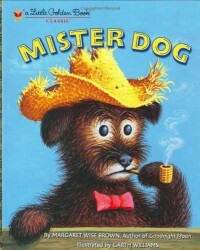 Surely I would love a book about Mister Dog the pipe smoking dog who belongs to himself! It turns out Mister Dog is not his name. His name is actually Crispin's Crispian. "His name was Crispin's Crispian because he belonged to himself." Sure. That makes perfect sense. This is one odd little book. "He was a funny old dog. He liked Strawberries." It seems there are people who are against this book due to the pipe smoking and the fact that a little boy goes home with the dog, etc., etc. It's a 1950's Golden Book with a pipe smoking dog. I'm not sure what folks really expect, but I do know that I expected a nice story at the heart of Mister Dog. Unfortunately, this book was a weird mess with one odd event after another. "This evening he made a bone soup with lots of meat in it. He gave some to the boy, and the boy liked it. The boy didn't give Caspian his chop bone, but he put some of his bright green vegetable in the soup." 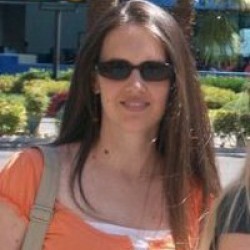 The writing style changed several times throughout the book which added to the overall strangeness. The only way I would recommend Mister Dog is in the "Hey, you want to see a really strange book?" kind of way. I haven't read this to my kids, and I don't plan to. I remember their reaction to But No Elephants. I'm not bringing them down that road again. All I can say is I'm a glutton for punishment. After writing this review I decided I'd try reading Mister Dog to my kids after all. My oldest declared: "That doesn't make any sense." I knew better. I really did.